I think that my favorite old photos of Disneyland are the ones you find on View-Master reels. 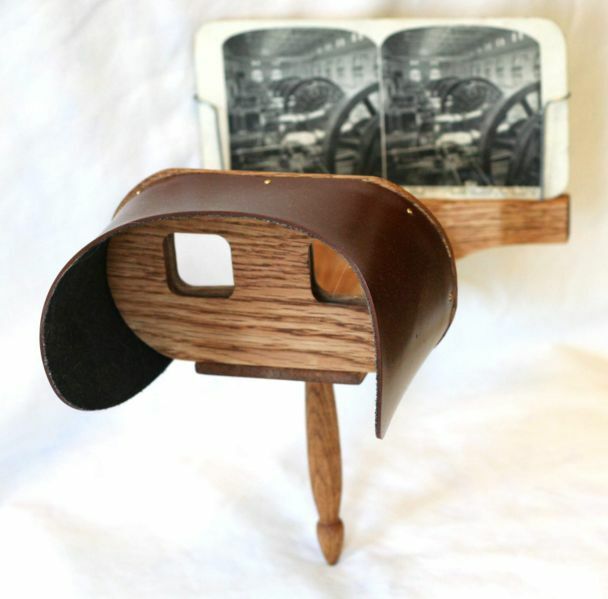 Through the magic of stereoscopic photography, you get a perspective that you can't get any other way. And the older they get, the more fun it is to (re)capture that "you are there" feeling. 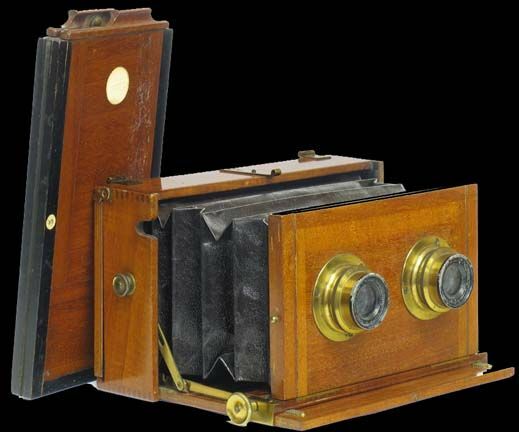 Stereoscopic photography uses special double-lensed cameras, thereby replicating the two images received by your two eyes and producing a pair of photos that provide a 3D image when seen through a special viewer, or even "free viewed" without any device at all if you're adept at the skill you use in order to see "magic eye" images. This kind of photography is nothing new. It's been around since the middle of the 19th century. 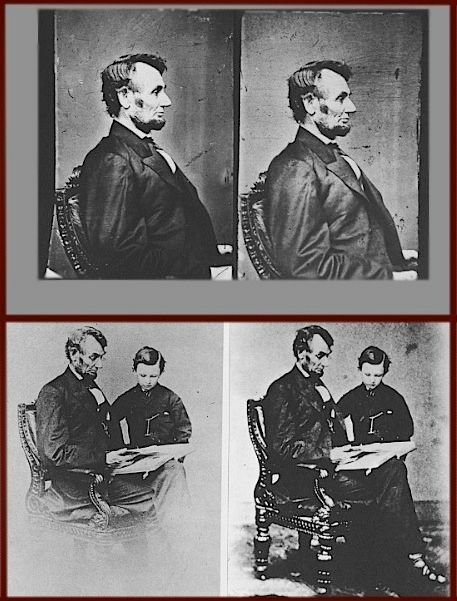 As an interesting historical note, many Abraham Lincoln photos were taken as stereographs. 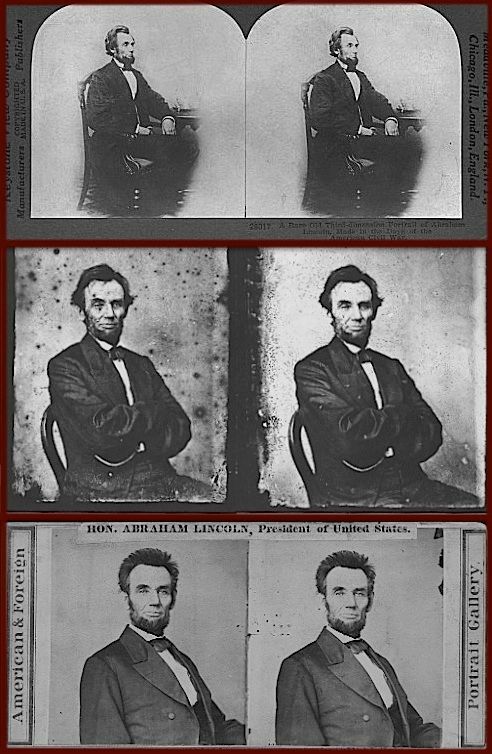 There are less than 135 known photos of Lincoln, and only nine of them were marketed originally as stereographs, but many "regular" photos of him are simply the left or right side of photos shot with a stereoscopic camera. 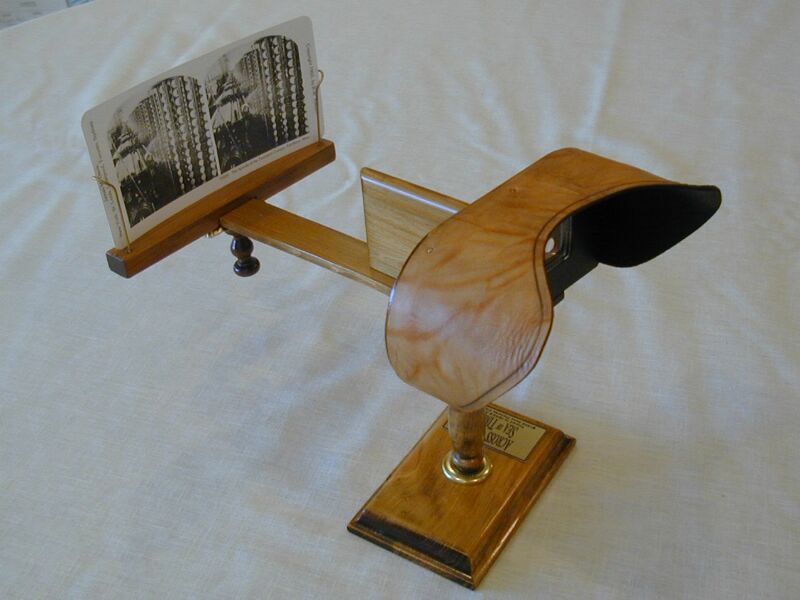 Stereoscopes were still a bit of a novelty in the 1860's, and photographers sometimes found it more profitable to print up one side of the stereoscope and sell it as a conventional portrait. 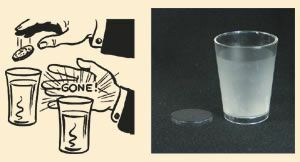 Sometimes the stereoscopic secret was not discovered until much later, when a sharp-eyed observer noticed minute differences between photos thought to be identical, and it was discovered that they were actually right and left sides of a stereoscopic image. The two could then be recombined and the stereo effect recovered. 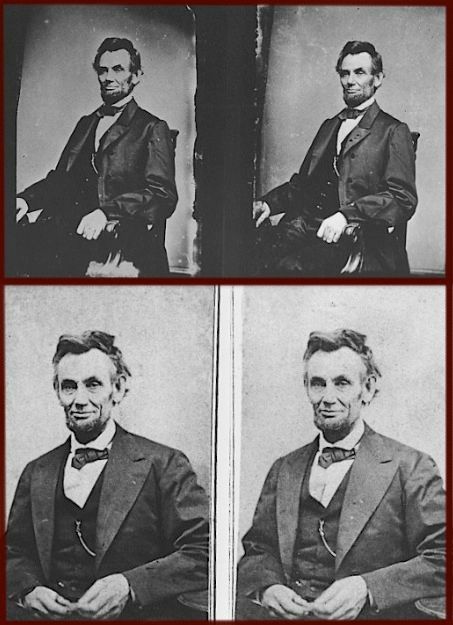 Some of those lately-recovered 3D images are among Lincoln's best-known portraits! This would obviously be appropriate content for a Great Moments with Mr. Lincoln blog, but what does it have to do with the Haunted Mansion? Well, the same thing happened to the Mansion that happened to Lincoln. 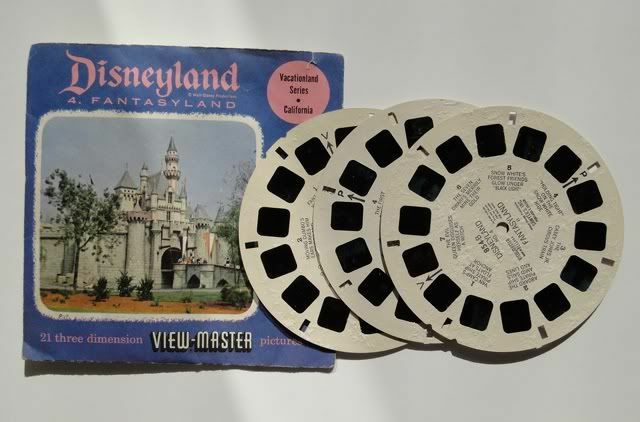 When the HM opened in 1969, they took the extant New Orleans View-Master set (three discs, 21 pictures) and trimmed seven shots out of it so that they could devote the third reel to the HM. 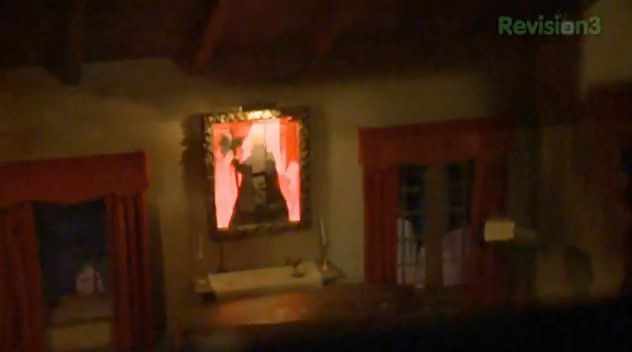 Those seven pictures are the only officially released 3D images of the Disneyland Mansion. 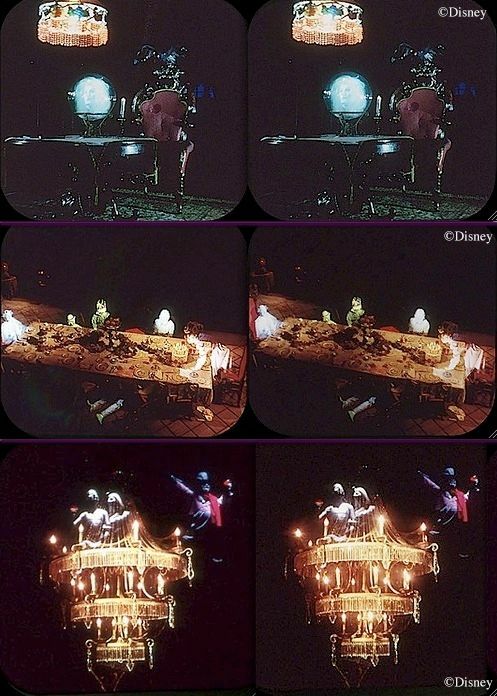 For the WDW View-Master set, they kept six of the seven the same and simply swapped out the exterior shot for a shot of the WDW exterior. Very nice set. But these six interior shots were simply the ones they selected to use in the View-Master reel. The photogs took a lot more than six! What happened to the rejects? Well, a lot of them were perfectly good photos, and so Disney kept them in their files and continued to use the left or the right sides for post cards, souvenir guides, magazine ads, etc. 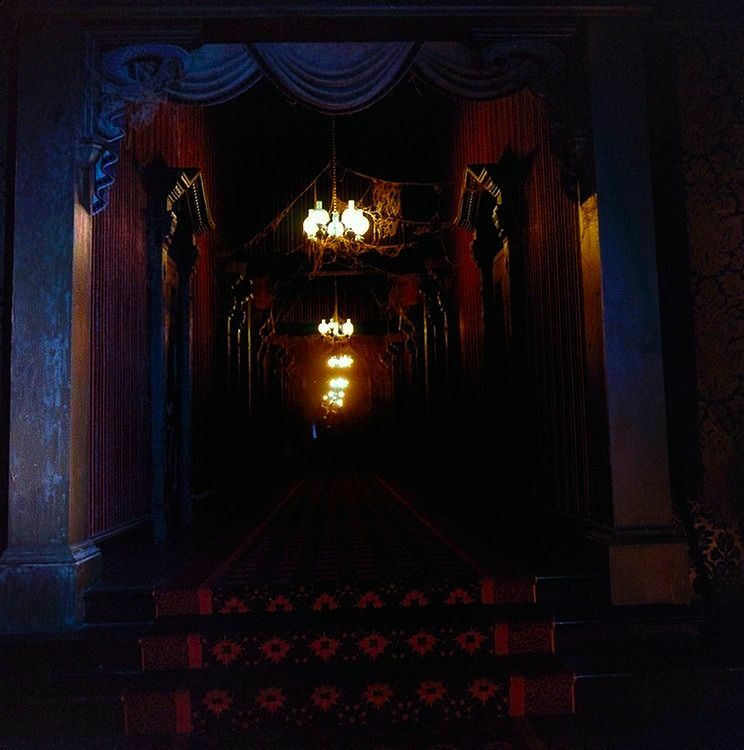 Looking at these, I have detected small differences between identical-looking photos and recovered at least three "lost" View-Master 3D shots of the Mansion interior, all taken in 1969. This first one I have posted before. 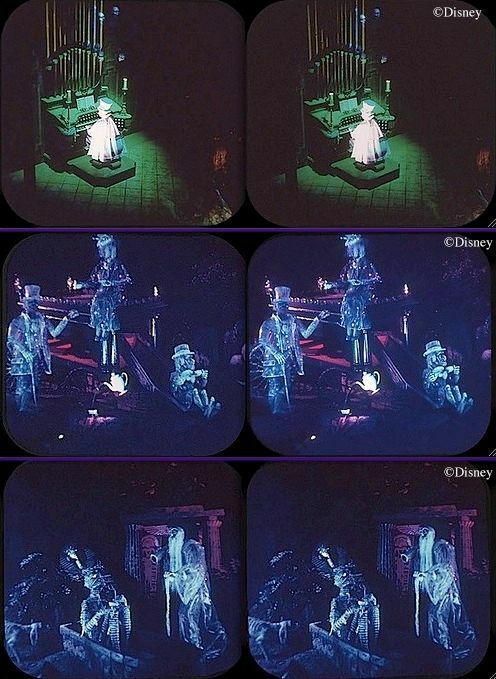 In this case the stereoscope is the same as one of the View-Master shots, but I think it's much better quality than the VM version (see above). One side is from a post card, the other side from a Panavue souvenir slide. In this next case, one side is from Gordon and O'Day, Disneyland: Then, Now, and Forever (2005: Disney Enterprises), p 124 . . .
...and the other is from a 1970 ad in Vacationland magazine. This Death Coach shot is probably my favorite 3D shot of all. The depth of field is amazing. 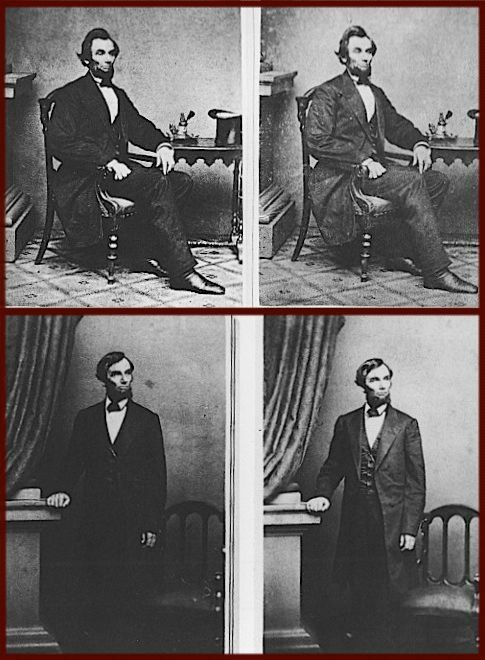 Actually, I have found three similar but slightly different photos of this scene, so I suspect there's a fourth picture floating around out there somewhere, and that there were at least two stereoscopic photos taken in succession during the same shoot. You can also cheat and create your own 3D stereoscopic photos by clever juxtaposition of consecutive (or near-consecutive) stills from video footage when the camera is slowly sweeping horizontally and the subject matter is not moving too much. Here are a few favorites I've created in that manner. If you are able to do the "magic eye" thing, these should be no problem, but everyone's different, and you may need to drag them to your desktop and play around with the size. Also, some people have better luck by reversing the photos and using a "cross-eyed" method. Me, I can't do it that way. 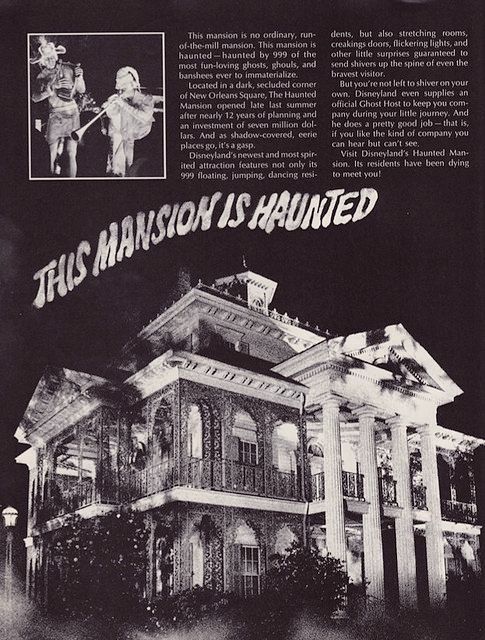 The Haunted Mansion: It's Magic! 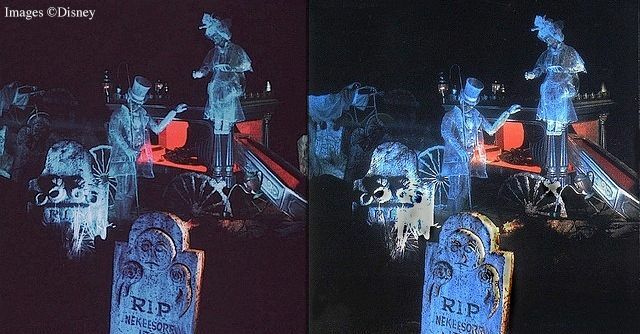 In the previous post I suggested that the Haunted Mansion represented a watershed moment in 1969, signaling that from then on, not every new "E-ticket" attraction would necessarily be bigger or more technologically sophisticated than the last one (or pretend to be). Originality? Craftsmanship? Solid showmanship? Yes. Always. Adding one more ball to the juggling act with each new outing, ad infinitum? No. I also discussed whether this was an accidental or deliberate change. But in the end, what the HM actually is interests us far more than what it was not. We've discussed HERE and THERE and everywhere some of the major thematic threads running through the ride, as well as its overall "three-act-play" structure. But judged strictly as a form of entertainment, the Mansion has come to be recognized over time as something unique and special, a positive expression of something that wears extraordinarily well. I've been trying to put my finger on it for a long time, and I think I may have come up with something at least worth putting on the table, submitted here for your approval. For our purposes here, I think we can ignore the graveyard scene that serves as the show's climax. There's nothing very mysterious there. It's essentially Pirates of the Caribbean with dead guys. Really, isn't that what that part of the show boils down to? 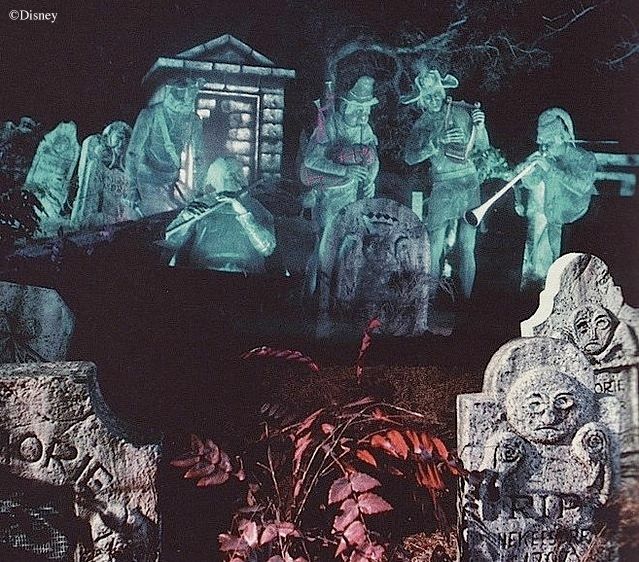 I'm not knocking the graveyard jamboree—it's great, but it isn't that scene that makes the ride unique, it's what comes before it. In fact, almost everything that comes before it. In a word, the Haunted Mansion has the feel of a magic show. 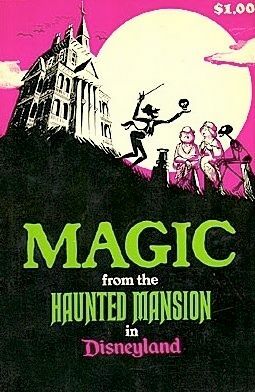 I have argued in a whole series of posts that Ken Anderson was the true father of the Haunted Mansion. The Anderson episode stands at the beginning of the story. At the other end of the story, it's easy to see the impact of the final team on the project as well. This is almost too obvious to talk about. After all, the final show script was written by X. Atencio (including the Ghost Host narration), and every single character and every single painting in the place goes back to a Marc Davis sketch. All the jokes are his jokes. And everyone credits Claude Coats for the creepy, moody environments found in the first half of the attraction. Okay, we've got the beginning and we've got the end. What about the in-between team? That would be Rolly Crump and Yale Gracey, hand picked by Walt, teamed up and given the haunted house assignment in 1959. "I still think these look better than those dopey musical instruments." "Heh heh. This is going to be good. Just as Walt opens the door..."
Rolly at play, following orders. Yale at play, following orders. As I've mentioned at least twice before, both of these guys were card-carrying magicians (in Rolly's case, we should say "still is"). I've come to see that fact as crucially important. 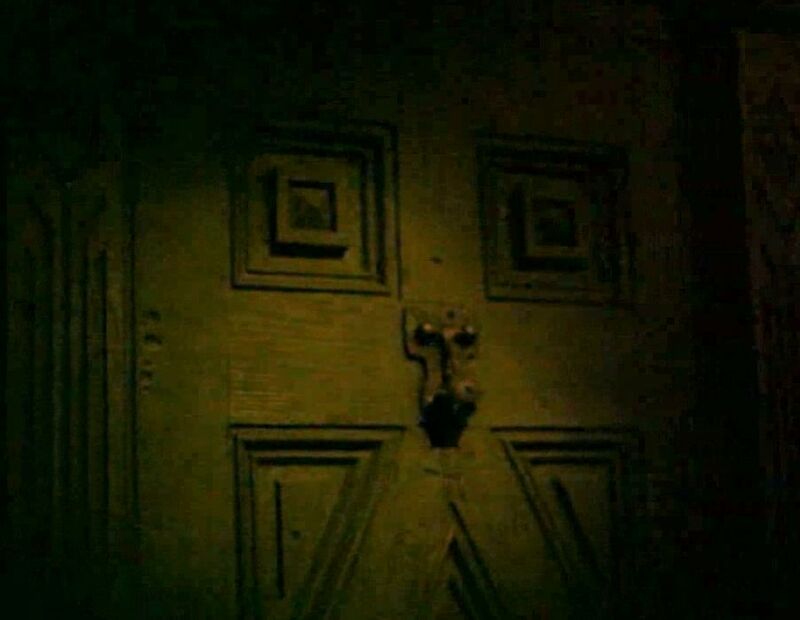 We have also seen that a lot of the things you encounter in the Mansion go back to stage tricks and gimmicks used by Victorian-era magicians, phony mediums, and elaborate cabaret acts. We've sat in the audience at Davenport Brothers shows and have even been seen hanging out at the Cabaret du Néant, feeling strangely at home. 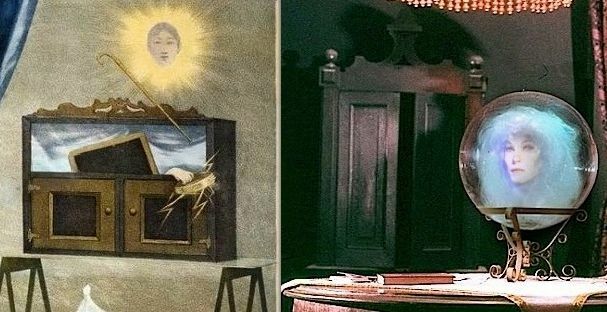 Rolly himself has said, "The illusions Yale and I were perfecting were based on the 'black art boxes' and 'spirit cabinets' that had been used for many years by magicians" (Surrell, p. 20). Magic. There's something magical about it. I'm not talking about the "real" magic of wannabe sorcerers and voodoo priests, or the fantasy magic of Tinkerbell; I'm talking about good old rabbit-out-of-a-hat, pick-a-card-any-card magic. The stuff you loved as a kid (and you know you still do). Me, I could never get past the Main Street Magic shop or Merlin's in Fantasyland (RIP) without going in at least for a quick peek. I loved to watch the demonstrations. Incidentally, that's how Steve Martin started his career, in case you didn't know. 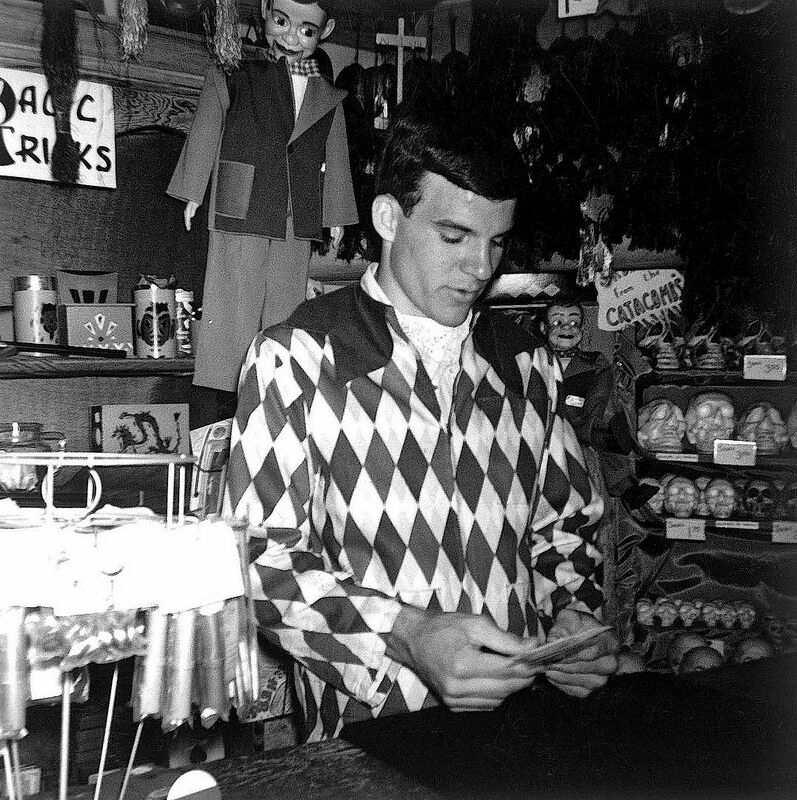 Here he is doing magic in one of the Disney magic shops, circa 1960. While you're looking at Steve, I'm looking at those "Chinese" boxes and "devil" tubes on the shelf. When he brings one of those brightly colored devices down to the counter and starts showing all of us that it's clearly empty, you know what's going to happen, more or less, but how can you resist? You have to see it. You want to take that "how did he do that?" feeling out of the shop and let it roll around in your mind. It is a pleasurable frustration. And that sense of surprise and curiosity will entertain you anew every time the memory returns. "You know, I still can't figure out how he did that." It's a world of playing cards, metal rings, rubber balls, gaudily painted wooden boxes, glass tubes, and silk handkerchiefs. In part, it's the low-tech quality of these tricks that makes them so much fun. I don't know why that is. We are being fooled—and we know we are being fooled—by devices cleverly contrived but basically very simple, manipulated by sleight of hand. When you learn how one of these tricks is done, you typically feel a little foolish, because the answer is usually so ridiculously simple. You were taken in by a series of faulty assumptions, often based on optical illusions. The point I'm trying to make here is that with magic, there seems to be an inner bent that runs exactly opposite to our more overt bent toward technological progress. If you need lasers and computers to make the elephant vanish, that's good, but if you can do it using only smoke and mirrors, somehow that's better. And it's more delightful for both the magician and the audience. Like I said, I don't know why. 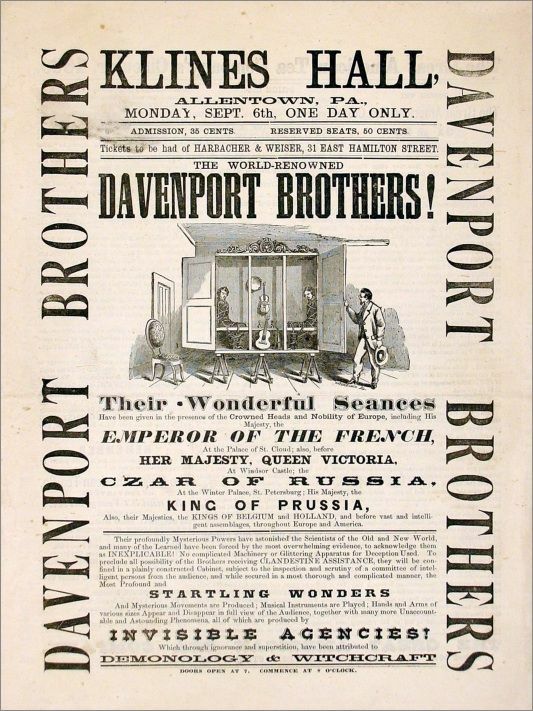 "No complicated Machinery or Glittering Apparatus for Deception Used," brag the Davenport Brothers on one of their posters (see below). I've mostly been talking about "close magic," parlor magic. Stage magic has a quality of its own, of course. It's theater; it's a show. But in the sense we've been exploring, it's not that different. You see the trick. You know there's probably a simple explanation. You can't figure out what it is. You love it. And remember, the golden age for this sort of thing was 100 years ago. are wandering through a huge magic show. It evidences a magician's instincts. The first trick is the stretching room. 1969 in 3D. Do the "magic eye" thing and the gargoyle will jump into your lap. Like magic. It's presented as a puzzle for you to solve. Until the very end, you're not scared—how can anyone be scared while they're staring at a guy in his underwear standing on a powder keg? "Is this haunted room actually stretching? Or is it your imagination?" This is classic misdirection. The truth, of course, is that it is neither a hallucination nor a matter of supernatural stretching. 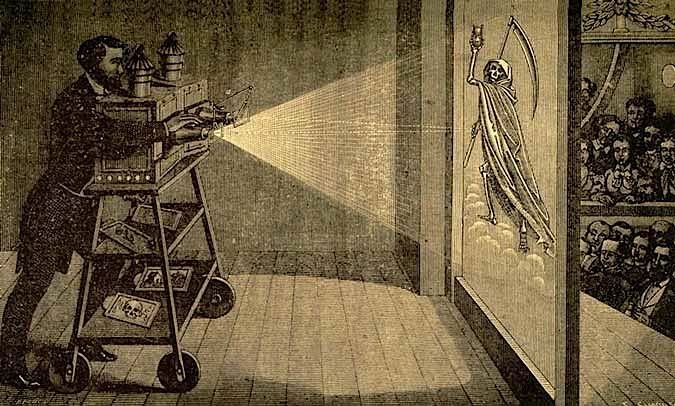 The smooth patter of the Ghost Host is deliberately designed to lead your mind away from the truth and put it to work trying to choose between two impossible options in a false dichotomy. 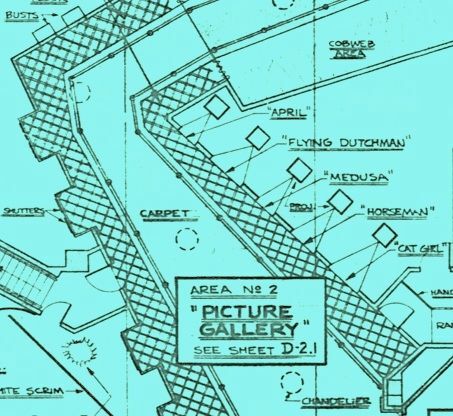 What you really have is a complex system of telescoping panels (and at Disneyland, it is pretty complex, compared to WDW, Tokyo, and Paris). This is disguised to your eyes, in part, by the innocent-looking striped wallpaper pattern, without which the illusion could not be done. And your brain naturally assumes that a framed portrait is a rigid thing, but if the "wooden" frame is actually foam rubber, it can be rolled up! Hadn't thought of that, had you? There's nothing here that the Davenport Brothers team couldn't have appreciated. And that includes the elevator. The stretchroom elevators were custom-built for Disney by the Otis Elevator Company. Oddly enough, this wasn't the first time Otis had been called upon for this sort of thing. One of the Davenport Brothers' stage managers, Harry Kellar (b. 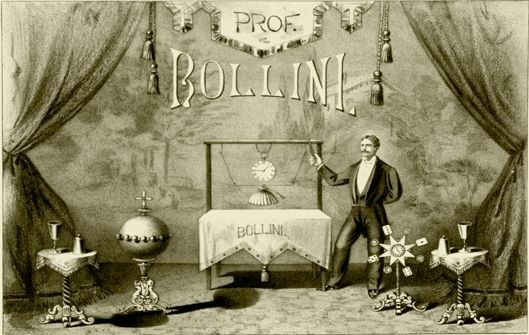 1849), left the DB's in 1873 and developed his own highly successful magic act. 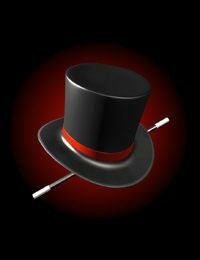 (In fact, he eventually came to be known as the "Dean of American Magicians".) 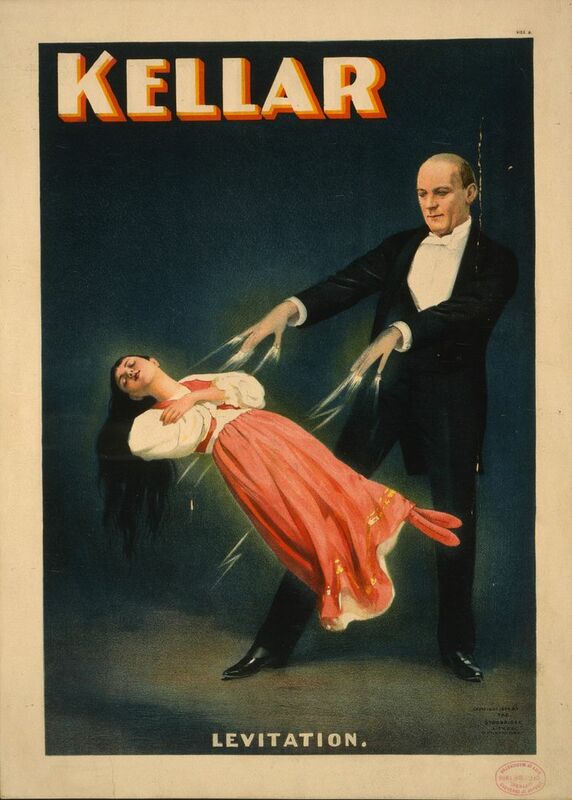 Kellar's most famous illusion was "The Levitation of Princess Karnac," a truly spectacular trick that made its debut in the 1890's. Kellar developed this illusion with the help of the Otis Elevator Company. by the Davenports. 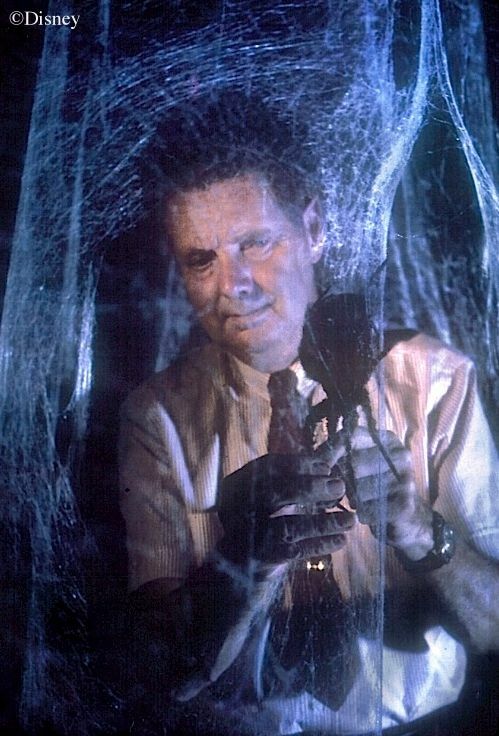 Kellar found oodles of new uses for it, including the materialization of a disembodied human face. 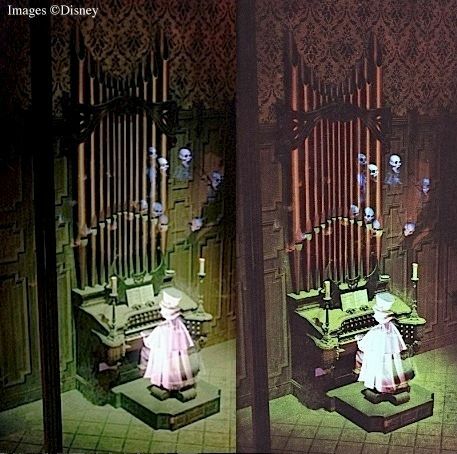 I only mention it because, you may recall, Madame Leota was originally going to be facing the opposite direction and was going to be produced by a projection from the "spirit cabinet" behind her, which is still there today. You have to wonder whether Kellar served as any kind of inspiration. We may never know. If there was a connection, it is by now long forgotten. Moving on from the stretching room, we find ourselves in the changing portrait hallway. 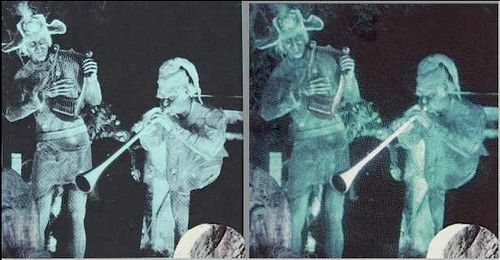 The current, 2005 version of the portraits is produced in a manner that may not be too different from what the Cabaret du Néant was doing in the 1890's, as we have seen, but the original changing portraits were done using back projection, with custom-made slide projectors developed by Yale Gracey. Slide projectors are pretty low tech. 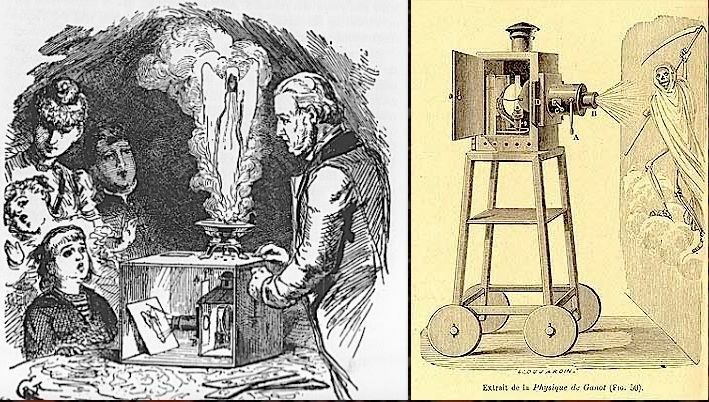 At Doombuggies.com, the Chef talks about the 18th century "magic lanterns." two-slide projector that allowed one picture to dissolve into the other, and back again." Funny thing, but from day one, it seems like the primary purpose to which these projectors were put was scaring the crap out of people. Let's turn and look at the follow-you busts. They're one of the easiest effects to figure out, but it doesn't even matter, because it's still delightful long after you have learned what it is. A visual trick, an optical illusion. You know all that, and yet you still move back and forth a little, enjoying the look of the effect, dontcha? The convincing force of the illusion still pushes back against the protests of your cold and certain knowledge. Can there be any doubt that much of the charm of the follow-you busts lies precisely in how simple the trick is? 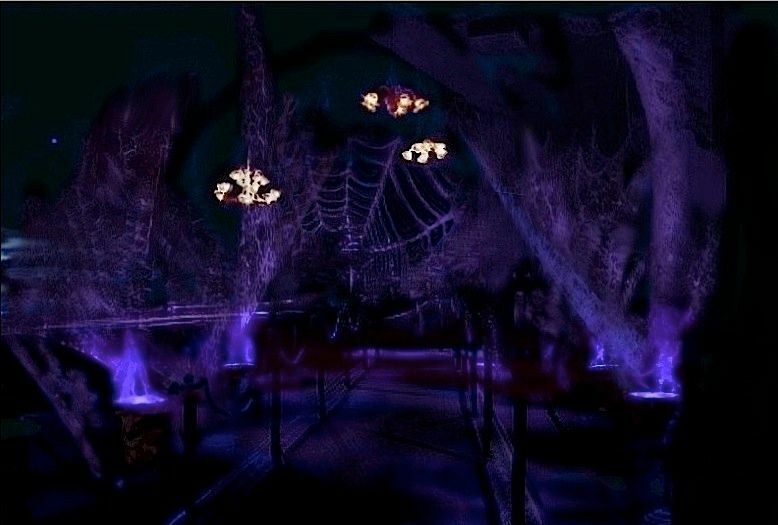 If it were properly lit, the Limbo load area would be a mammoth demonstration of another gimmick from the stage magician's bag of tricks: painting things flat black and keeping them in dim light, so that something looks like nothing. Old as the hills. Plenty of magic tricks use this gimmick, but it's the ghost shows and phony séances that relied on it for their very existence. Of course, it's too bright in there nowadays for the effect to work, so look for it only in blogs, my children, an illusion gone with the wind. On to the next. Tell me, Forgottenistas, exactly how long did it take you to figure out that the Endless Hallway was a simple mirror trick? First ride? Second? Okay, and once you had figured that out, how long did it take before it lost its charm and became boring? Me neither. "I know it's just a mirror, but it looks so cool!" The Conservatory scene, with Coffin Guy, is the first real detour out of the world of the magic shop. It's basically a POTC-type tableau, a stage peopled by mechanical actors. Yet even here we're being led down the primrose path by the magician's hand. It's hard not to fill in the blank produced by a pair of hands and forearms. You know there's probably nothing more to the guy, and yet in your mind's eye you can't help but "see" him in there anyway. This is a mental glitch long exploited by magicians. If you see a piece of the pencil going in here and another piece sticking out the other side in the right place, it takes real effort to keep your brain from concluding that it's one full, continuous pencil, and the magician is going to use any number of subtle distractions to rob you of the opportunity to apply that mental effort. In the case of Coffin Guy, you may be aware that they are suckering you with a fill-in-the-blank gimmick, but your (completely irrational) resistance to accepting this fact can become a form of entertainment in its own right. We enjoy being tricked, that's all there is to it. But if you think imagining a complete Coffin Guy from a pair of hands is a neat trick, you ain't seen nothing yet. The Corridor of Doors. 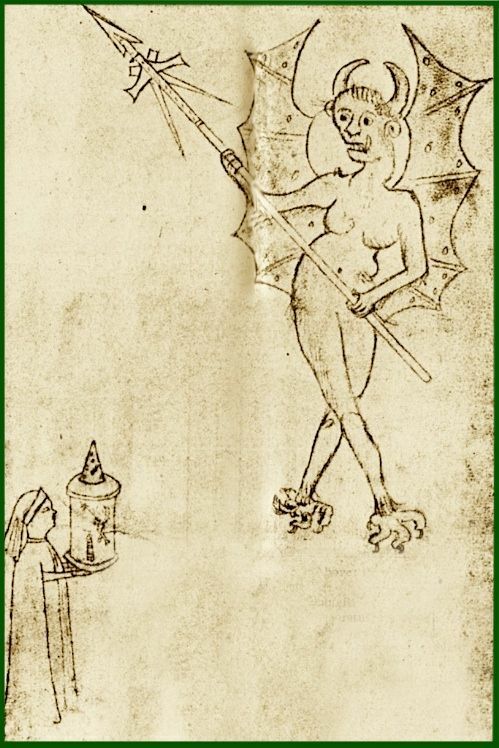 There, now you have seen nothing—nothing masquerading as something. Same principle as Coffin Guy from the wrists on down, but here taken to an extreme. Theatrical stagecraft relies a great deal on the viewer's unthinking assumption that there's got to be something behind a carefully crafted façade, but there are plenty of magic tricks that use the same principle. In this case, there's something about a door set into a wall that makes it practically impossible to dislodge the notion that there's a room on the other side. 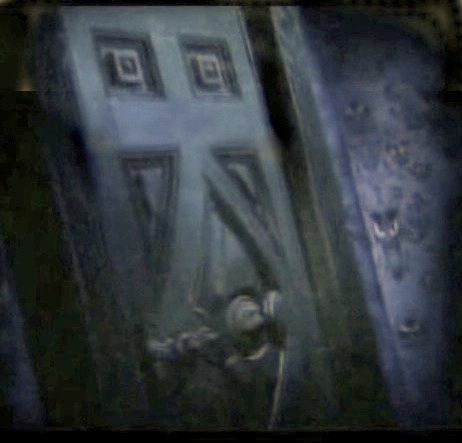 You know there isn't anything on the other side of most of those doors, but just try to convince your stubborn imagination of that. Such a deal! Whole rooms of angry ghosts created out of nothing but sound effects and a few simple animations. The illusion is irresistible, so you may as well declare a cease fire and bask in the fun, creepy, temporary reality created by the deft exploitation of your mental quirks. We've reached the Séance Circle. We've already discussed this room HERE and HERE. 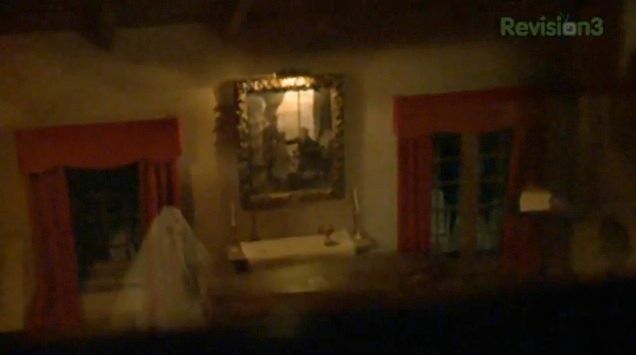 In large measure, it's a reproduction of a real fake séance or ghost show such as you might find in the Victorian age. We can add one more fun detail before leaving, however. 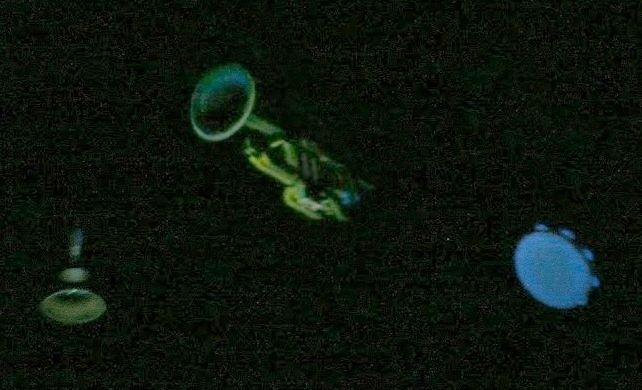 In those earlier posts we learned that the three instruments flying overhead in the inner circle—the horn, the tambourine, and the bell—were not random choices. Those were the flying instruments commonly seen at Davenport Brothers shows. Well, it seems this little tradition was passed down faithfully. 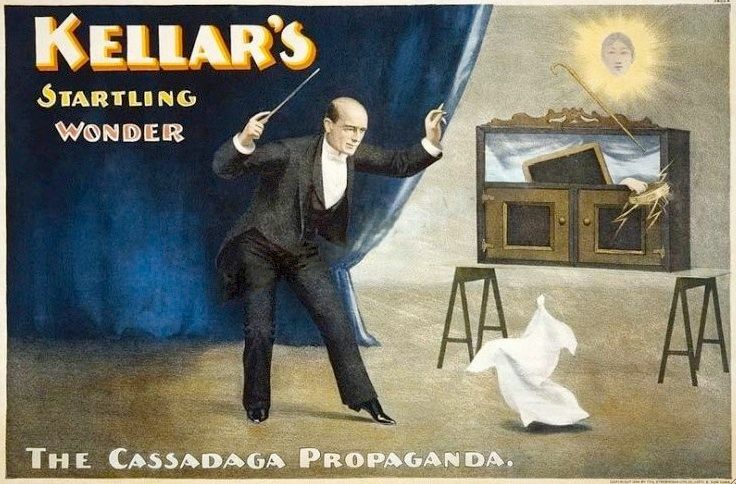 We've seen that Harry Kellar, a former DB employee, went on to become a successful magician in his own right. 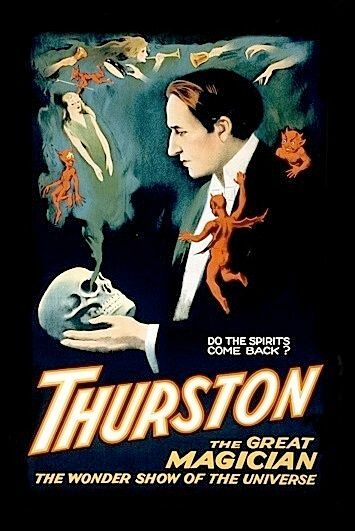 When Kellar retired, the magician groomed as his successor was Howard Thurston, who became a major figure in the world of magic as well. Anyway, on some Thurston posters, there they are, across the top: horn, bell, tambourine. This brings the Davenports' traditional triumvirate of tinkling, tooting, and tambourine twirling out of the mid-19th century and down to the mid-1930's. Yale, Yale, Yale. 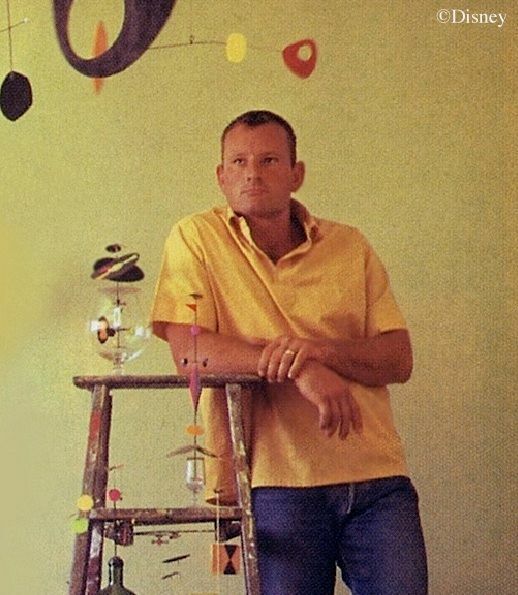 What about Rolly Crump? 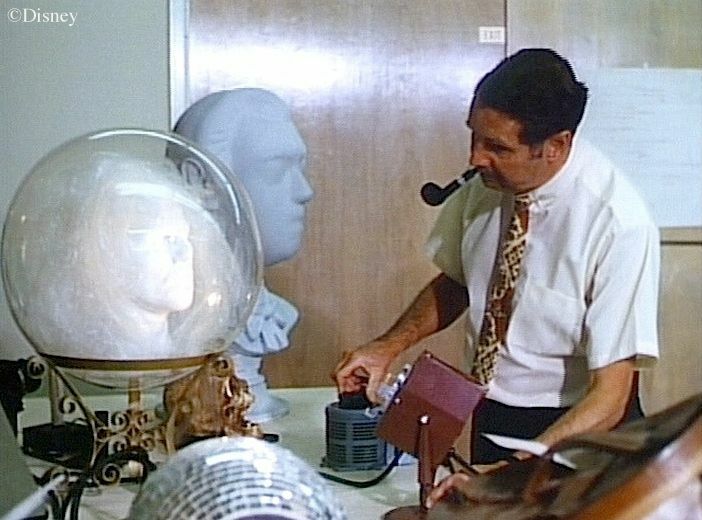 After the collapse of the "Museum of the Weird" project, it's sometimes hard to pin down Rolly's contributions to the finished attraction. 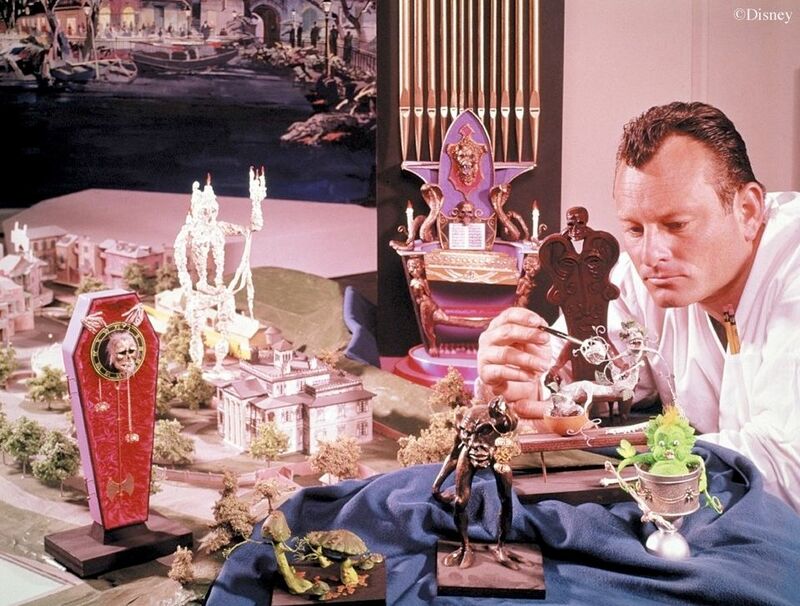 Rolly had (and has) a bold and original imagination, and Yale was a brilliant special effects man. I have to think these two magicians egged each other on, creating and making, making and creating. Hard to tell how much of Yale's work had Rolly's hand in it, but there can be no doubt that it was there. Someone might object to this whole presentation on a couple of grounds. First, isn't a lot of the stuff I'm talking about here more accurately described as stagecraft? You can find fake doors all over the place in Disneyland. The HM is a show, isn't it? You could even say it's a type of theater, and what is stagecraft after all but clever deception? There is no need to turn every prop on the stage into an abracadabra moment. Second, aren't other rides, like Pirates, also loaded with this sort of "magic"? What's so unique about the HM? As to the first objection, yes, it is stagecraft we are talking about in many cases. The difference is that here, in the Mansion, that stagecraft has become the very substance of the presentation. It's not something employed as background to the "real" show, it IS the show. As to the second objection, yes, of course there are lots of tricks in the other rides (in many cases thanks to the same guy, Yale Gracey). But the answer to this objection is the same as the answer to the first: in those rides the tricks are background to the "real" show. Yale invented an astonishingly realistic-looking fire, using a sheet of plastic, a fan, and an orange light bulb. The burning town in POTC makes good use of it. Another Yale invention, the fireflies in the Blue Bayou lagoon, is an excellent trick. They are simple and yet amazingly realistic. The fire is breathtaking, the fireflies are delightful, but nevertheless, they are never the focus of the show; they are only part of a beautifully done background. One last comment, taking up a point I've hit a few times along the way: repeatability. Magic tricks are fun to watch, even when you know how they're done. They wear well that way. 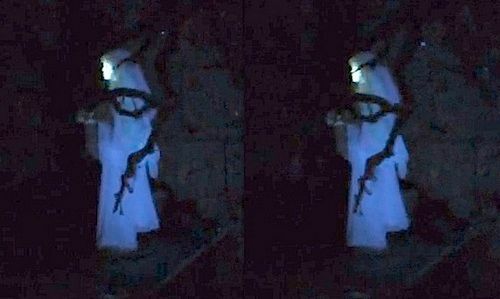 When you don't know how the Leota effect is done, or Pepper's Ghost, you tend to overshoot the mark in your attempts to figure it out. That's where all those silly mutterings about "holograms" come in. Like I said earlier, it's typical of magic tricks that they're usually simpler than you think, not more complex. But after you know how the ghosts are produced, you are still amazed at how convincing the illusions are. We need little coaxing to voluntarily forget what we know for a few moments and believe our lying eyes instead. It all makes for a very durable entertainment experience. 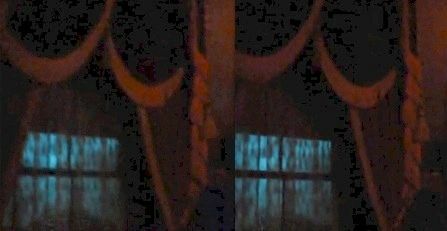 The "magic show" quality explains the Mansion's deliberately lower tech performance than some other rides, and in the end it may also be the secret to the Mansion's longevity. Thank you Yale. Thank you Rolly. Oh, another addendum. There's a little matter I forgot to mention. 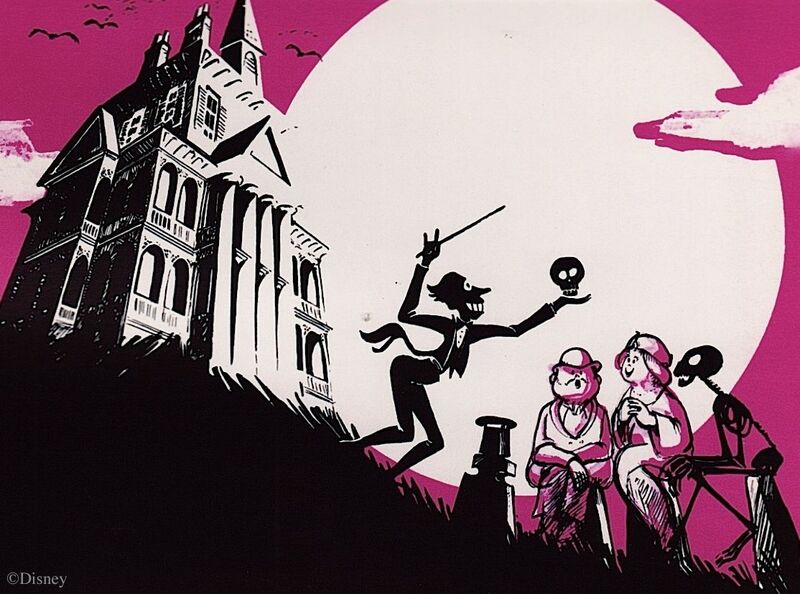 Is it any wonder that one of the earliest and most popular Haunted Mansion souvenirs was a magic book?